Over the past several months, we’ve been working to completely redesign our site in order to better serve you — our clients. You’ll find a cleaner look and feel, along with easier access to the information you’re most interested in. 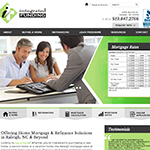 At Integrated Funding, our Raleigh, NC mortgage advisors work hard to put clients first. We build trust and friendship with our clients because it allows us to offer a personalized approach to finding the mortgage program that meets their needs. This is why we redesigned our site — to give us another avenue to connect with you, ultimately offering you the right mortgage solution whether you’re buying a new home, buying a vacation home, or simply refinancing your existing mortgage. To partner with us and begin the mortgage process today, contact our Raleigh mortgage company at 919.847.2766 to set up an appointment or for more information. As always, we’d be happy to answer any questions you may have. Integrated Funding offers personalized home mortgage solutions for those purchasing a home or refinancing. Our mortgage advisors are located in the North Hills area and proudly serve clients throughout Raleigh, Cary, Apex, Wake Forest, Charlotte, Wilmington and surrounding areas in North Carolina.